Whether you want to believe it or not, the back to school season is upon us. I am happy to say that this will be the first Fall season where I am not going back to school myself. So, part of me (actually the whole part of me) is wanting a confetti cannon to show how happy I truly am about not going back to school! Now, if you are going back to school, I’m sorry. I feel your pain and hope you have a wonderful year. In the meantime, making your own DIY school supplies might make the sting of going back to school a little less painful. Today, I thought it would be fun to share a no-sew DIY when it comes to creating your own pencil pouch. 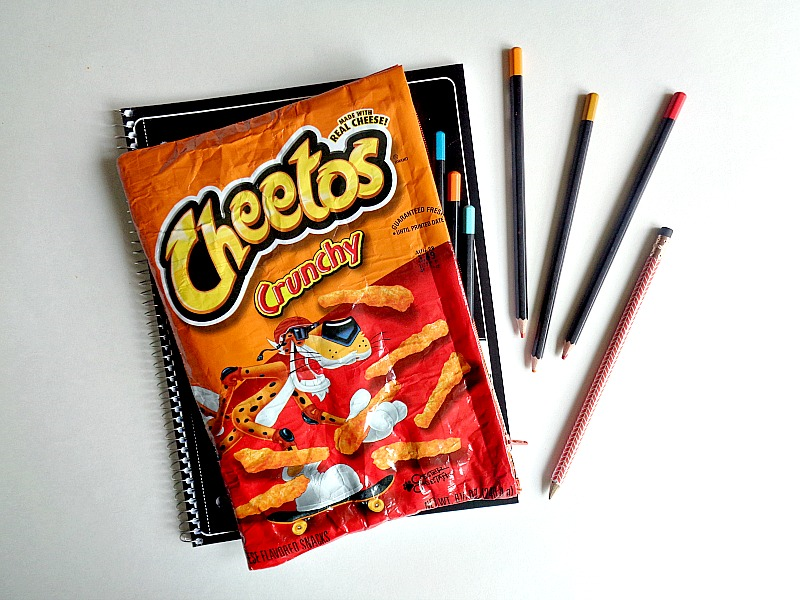 The cool thing about this pencil pouch (as you probably noticed) is that it is made from a chip bag! I got the idea for this project after seeing this DIY video on YouTube. The video itself, reminded me of an old cookie pencil pouch that I had when I was in school. 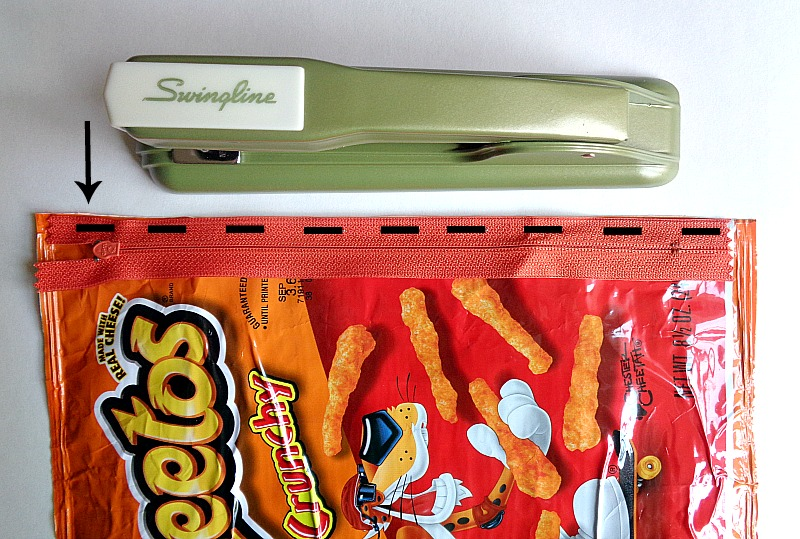 I wanted to recreate that type of pencil pouch for this DIY but thought a chip bag sounded like more fun. Before I begin the tutorial, I do want to say that the DIY video that I refer to throughout this tutorial is very helpful when creating this project. 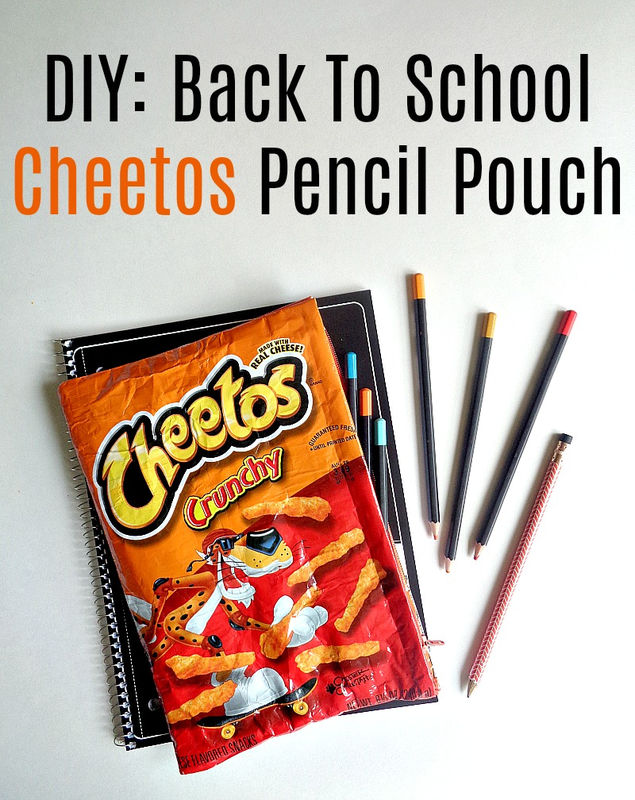 Personally, I did not come up with the idea of turning a chip bag into a pencil pouch or with this particular pencil pouch method. However, I could not find any tutorials that showed how to make a chip bag pencil pouch in the ''traditional pencil pouch way''. Meaning, that the zipper was on the side of the pencil pouch and not on the top or back. Due to that, I thought it would be ok if I showed my interpretation of this DIY. 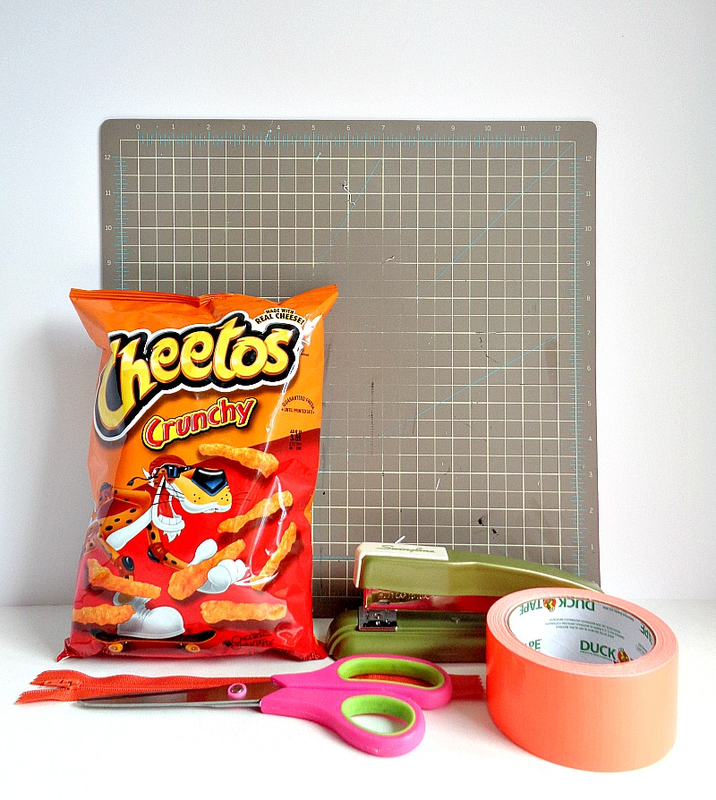 So, if you want to learn how to make your own Cheetos Pencil Pouch then keep reading below! Step 1: Eat your bag of chips (or transfer them to another bag to eat later)! Once your chips have been eaten, try to open the bottom of the chip bag the same way you would open the top of the chip bag. Then cut down the right side of your chip bag. Finally, clean out the inside of your chip bag with a wet paper towel or antibacterial wipe. Step 2: Flip you chip bag over so the silver side is facing up. Then begin to line the inside of your chip bag with pieces of duck tape. 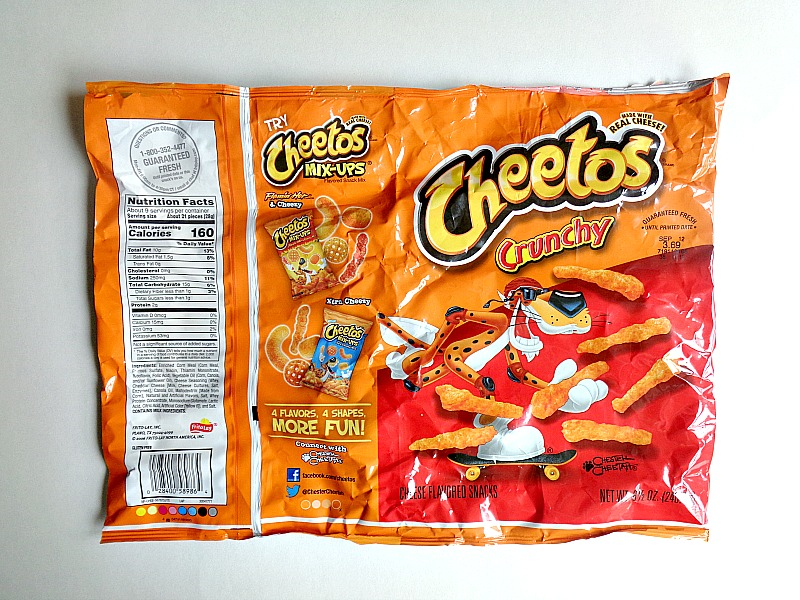 Once the inside of your chip bag has been lined, cut around the sides of the bag to get rid of any excess tape. Crafty Side Note: I found the best way to do this step was to work on a cutting mat because the duck tape came off of the cutting mat very easily, when you were ready to cut off the extra tape around the sides. Step 3: Grab your zipper and turn it zipper side down onto the edge of your chip bag. Then staple that side of your zipper into place. In the above photo, I made lines showing where the staples should go. Step 4: Now apply a piece of duck tape to edges of your staples, then bring that piece of duck tape over and adhere it to the inside lining of your chip bag. In the above photo, I made a box showing where that piece of duck tape should end up when doing this step. Once you have done this step, repeat steps 3 and 4 to attach the other side of your zipper. The only difference when doing these steps to the other side of your zipper is that when you adhere the tape to the lining, you will want your zipper to line up with the middle of your bag before you adhere the tape. 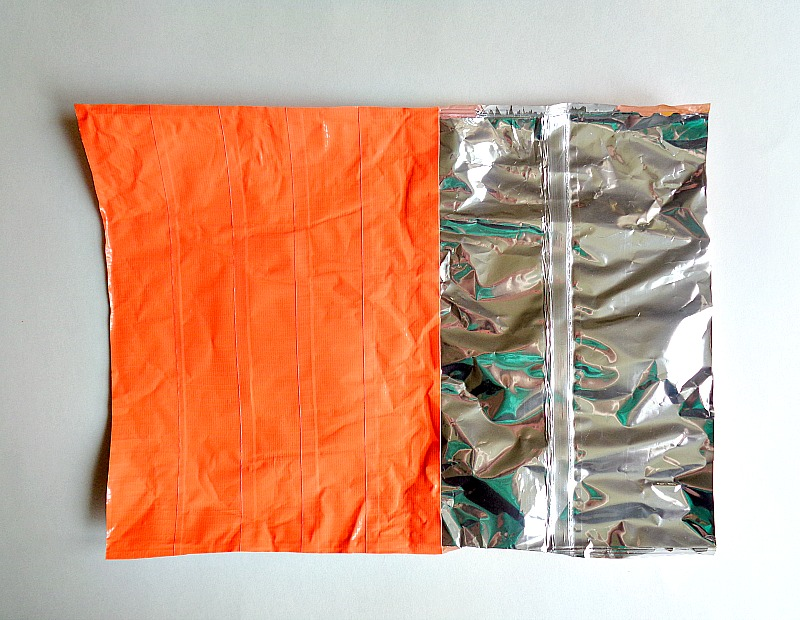 The final look of your bag (at this point) is that the right sides of your chip bag should be together, the zipper should be zipped, and the lining of your bag (the duck tape) should be on the outside. To get a better understanding of this step and to see a visual of this step, you can watch minutes 4:35 - 8:00 of this DIY video. Step 5: Now that your zipper is in place, it is time to close the sides of your bag. 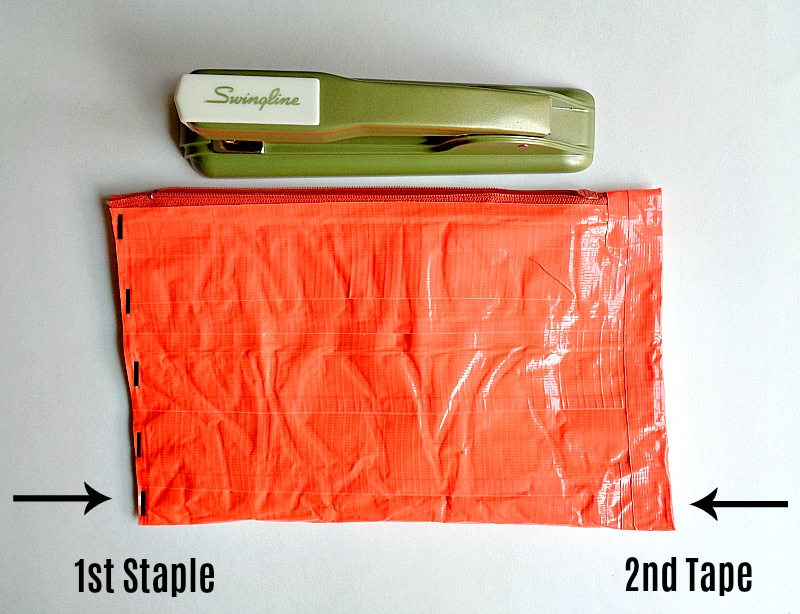 To complete this step, staple one side of your bag. 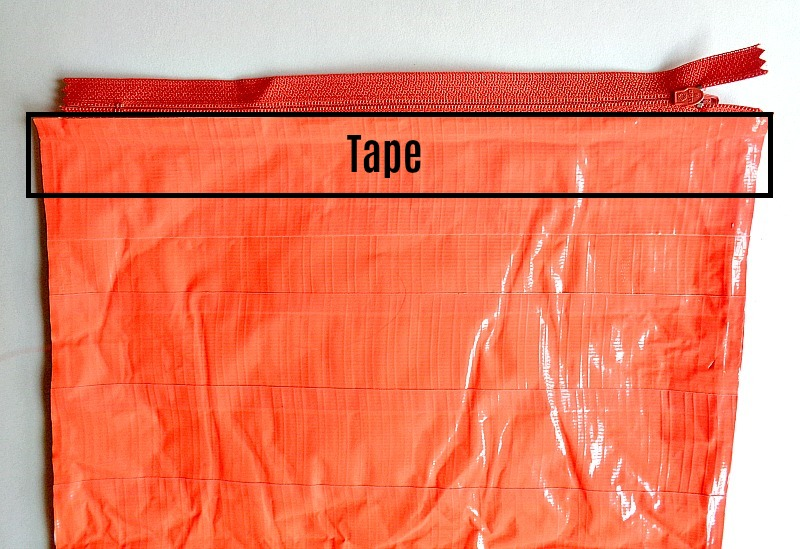 Then add a piece of duck tape to that side of the bag to cover the staples. Once you have completed one side, unzip your zipper and repeat this step with the other side of your bag. In the above photo, you will see, that on the left-hand side is the staples and on the right-hand side is how you would cover the staples up with tape. When your bag has been completely stapled and taped up, slowly begin to flip your pencil pouch right side out. Once your bag has been flipped right side out, you are ready to fill it up with your school supplies! I loved how this pencil pouch turned out and how it looks (in my opinion) store bought! I didn’t think I would like it as much as I did, but now I want to make a whole bunch of chip bag themed school supplies. As a pencil pouch, this guy has already taken a beating and has held up very well. The outside of pencil pouch (which I am amazed by) has not ripped or shown any signs of wear. So, overall, I think this pencil pouch would hold up quite nicely throughout the school year. So, what do you think? 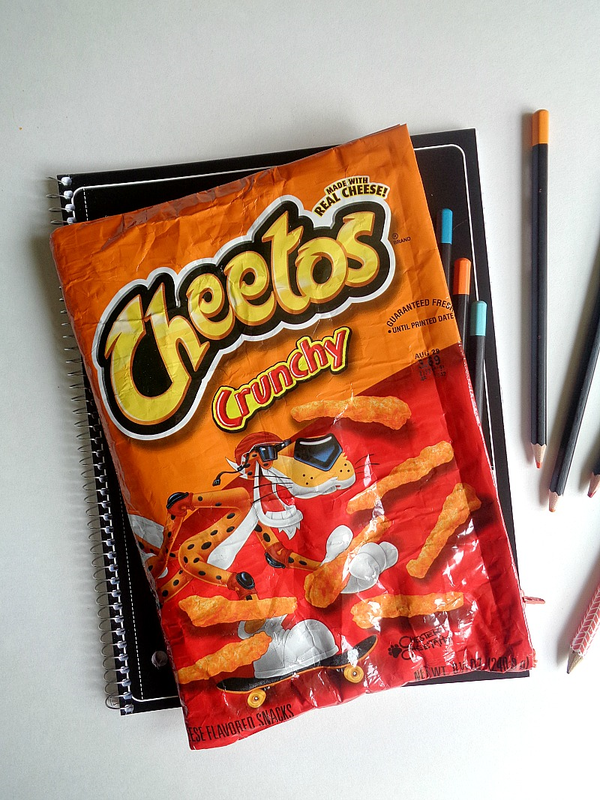 Do you like this Cheetos Pencil Pouch? 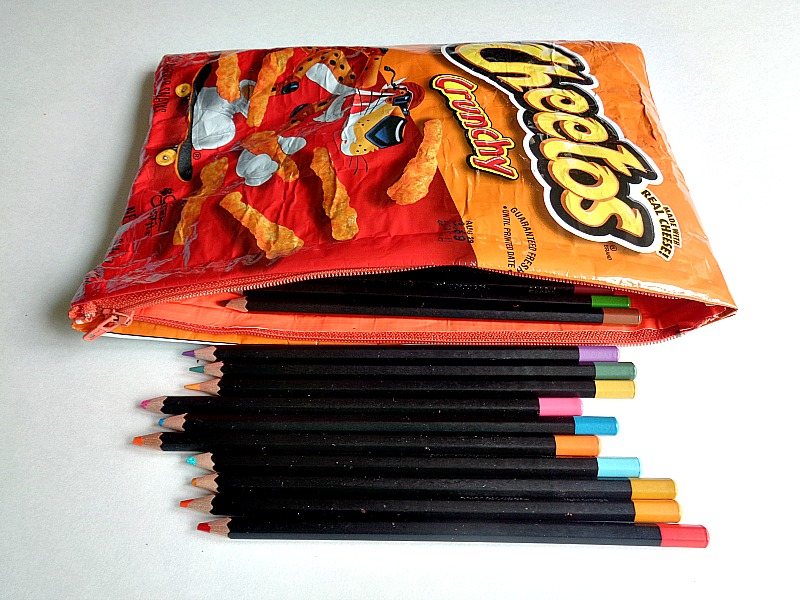 Also, if you made this pencil pouch what chip bag or candy bag would you use? p.s Come back to the blog on Thursday to see another back to school DIY which features Xyron! !